Rasa and I have a mixed household. Aside from coming from two different generations and two different cultures with two different languages, we also have mixed views on social media. For myself, I’m fairly active on Facebook and Instagram and Goodreads among others. I have no problem with letting the world know where I am or what I think of that place. Rasa, on the other hand, has no social media footprint at all. In the technological world of our AI Overlords, she doesn’t exist (outside of this blog where, for all you know, she might just be a matrix-like construction of my imagination). All of which brings us to the problem of Speck, our soon to be child. The first thing is that, well, Speck is no longer a speck. According to all the books, Speck is now (at 32 1/2 weeks) a fully formed little person who is still growing but in the “safe survival range.” The second thing is that as we get closer to the due date (officially, sometime in early July, but we figure late June is more likely) we’ve been having discussions about what role Speck will have on social media. There are three basic schools of thought, near as I can figure, and none are any better or any worse than any other. There’s the school which says it doesn’t matter, and having pictures and names available online is just the cost of being alive in the 21st century. There’s the school which states pictures are fine, but let’s use nicknames so the child’s identity can at least be partially preserved. And finally, there’s the school which states no facial pictures and no real names, at least not until the baby is old enough to make an informed decision for themselves. As with all good relationships, Rasa and I talk and debate and weigh our personal pros and cons. We compromise and cajole. What we finally decided on was that, for us, the third school is the one we’ll be attending. Once the baby is born, you will not see a picture of that cute smiling face, or hear us refer to an actual name, on social media. This doesn’t mean there won’t be pictures or no one will know the name. That’s ridiculous. We just won’t be broadcasting this information for the world at large. With that in mind, though, in addition to coming with an actual name for the little one, we also had to come up with a “screen” name and for that, we’ve chosen “Monki.” Since the baby will be born in the Year of the Monkey (same as the baby’s lovely mother) it seemed appropriate. 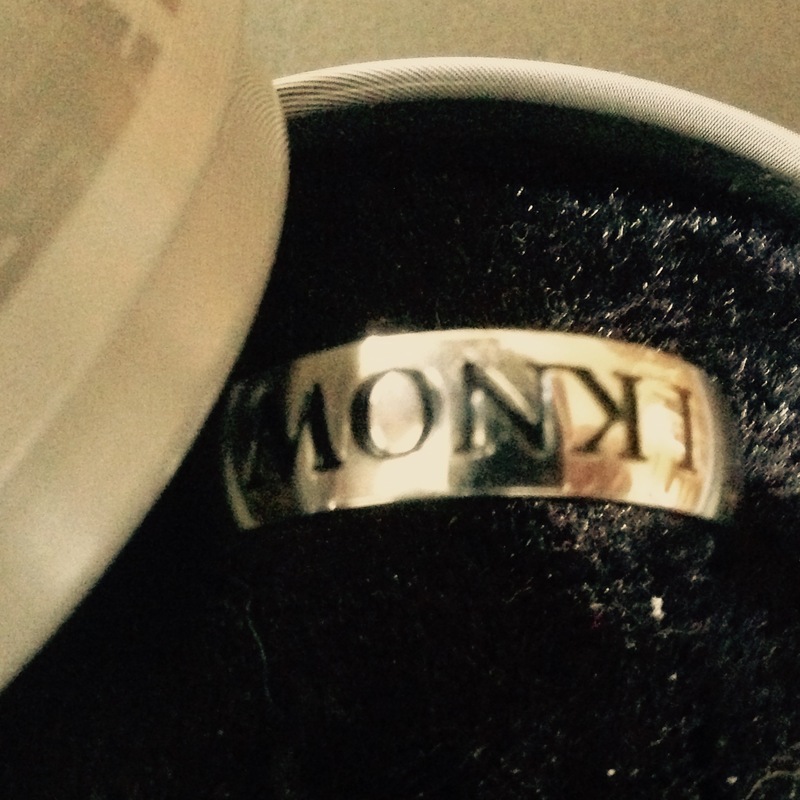 As for the unusual spelling, well, as you know, our rings make up the two part phrase from The Empire Strikes Back: Rasa’s starts the phrase with “I love you” while mine completes it with “I know.” While looking at my ring the other day, I noticed that upside down, it spells out “Monki” and since coincidences are too much fun not to play with, we figured this was the final piece of the puzzle. So “Monki” it is. Oh yeah. I almost forgot. Monki is a girl. We weren’t going to announce this particular bit of information before the birth, but the gendered economic state of the world has made it increasingly difficult to keep it a secret. For instance, while filling out our Amazon registry, it turns out getting gender neutral items becomes slightly problematic. Even diapers, it turns out, are gender specific. So there were only so many “boy” things we could list (in an attempt to throw off suspicion) before it became silly. So there you have it. Monki is a girl and from now on we’ll be using the feminine pronoun when referring to her. As a reminder, since people keep asking, our Monki Business Etsy list is here. I for one applaud your approach to Monki’s online presence. Do you remember Tom Reynolds from the Groundlings? For the short time I was on Facebook, his son had his own FB account. It was slightly creepy because you know the parents are writing the posts, and you know that this toddler might (or might not, who knows) resent later in life the posts that were publicly made in his name. Cole, yeah. And I would never do that. I get it. My husband only exists on Facebook (so he says) so I have someone to be married to in my status, otherwise he’s a programmer/computer geek with no online presence. We made a private Facebook group to share photos and videos of baby with out of town family and close friends, so I don’t post a whole lot of specifics about J that all of my Facebook friends can see–and I have way fewer friends than you! Good luck. You may find you renegotiate this a million times down the road. I’ve never bought from an Amazon babylist before. And I don’t see the one thing I want Monki to have – Sendaks’ ‘Where The Wild Things Are’. Anyhoo, how do I order off-piste and get it to you? You can email me directly with delivery instructions. https://captainjaq.wordpress.com/about/ has the address for either us here in Lithuania or back in Vegas. You can order from Amazon.co.uk ( http://www.amazon.co.uk/dp/0099408392) and have them ship it directly here. And you’re right, more books need to go on the list!